This spring I posted about how pointy-headed fisheries biologists can age fish. In that post I specifically highlighted the age and growth of a couple of Nebraska muskies, https://barbsandbacklashes.wordpress.com/2010/04/08/how-old/ . Well I got another one. 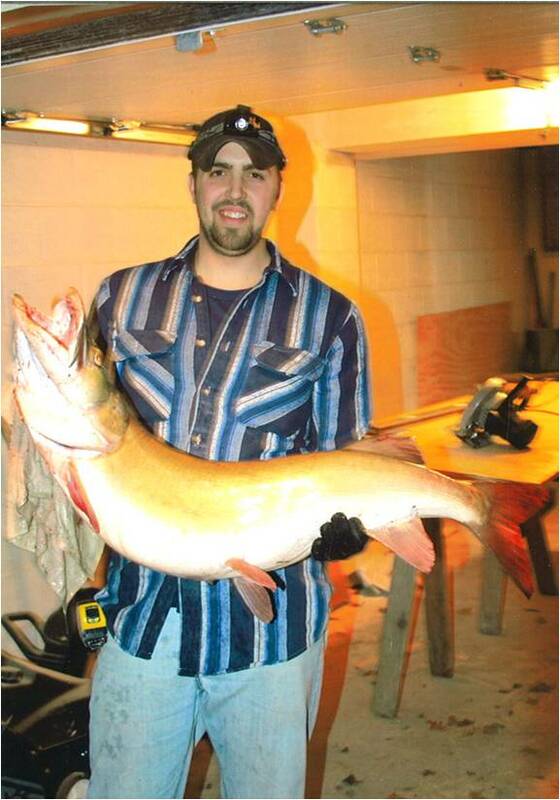 Early this spring there was a 43.5-inch, 27.5 pound muskie taken from Wagon Train Reservoir. The fish was taken to Bob Palik Taxidermy here in Lincoln (I would post a link if there was a website for Bob, but I could find none. If you want contact information for Bob Palik Taxidermy, let me know and I can provide that for you.). Bob scraped a few scales off of the fish and sent them to me. Aging pike and muskies from scales can be tricky, but after looking at the scale samples I received, I judged that Wagon Train muskie to be . . .
9 years old, a fish stocked in the early spring of 2002, the first muskie stocking after the Aquatic Habitat Rehabilitation Project. Again this reflects a growth rate that is a little bit faster than average as a 9-year old muskie usually would be in the neighborhood of 41.9 inches long. I do not know the ultimate size muskies in Wagon Train might attain, but it is nice to know there are some fish over 40 inches in there now. This fish was obviously very healthy and had good growth; given some more time, who knows? That alone is a good example a what is possible in our fisheries. That is one awesome fish!!! If you put in the time, you have that chance. Go out with a purpose to catch a fish like that and you’ll be surprised they are there. You have to work for them. You can catch big fish in Omaha, you can catch them in Lincoln, it’s how many you think you need to catch to be a great fishery….. Still, it certainly piques ones interest in getting out and trying! Thanks for the report, Daryl! Nice fish, but if anglers in NE would like to increase their chances of catching trophy fish such as that one then CRP should be encouraged. (catch photo release)Such is the practice in states that produce trophy fish on a regular basis. Also, with a few measurements and a good photo a replica can be made of any fish.